With an abundance of drainages and geographic variety ranging from lowland flats and undulating foothills to steep draws and high ridges, Eugene, OR is a hiker’s trove. 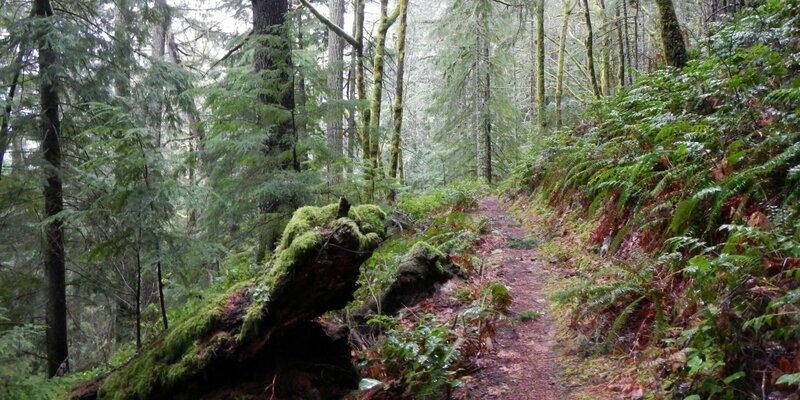 There aren’t many Oregon communities that offer such a diversity of trails that are also so easy to access, and the mild climate means there is always a good trail option, even in winter months with high rainfall totals. In fact, winter is an ideal time to view any of Eugene’s nearby waterfalls, as the flows are likely near their peaks. Spring and summer generally bring modest temperatures that are ideal for hiking, and the late summer heat waves are when many of the hikes along local waterways really shine. Fall is the perfect time of year to get out and enjoy the deciduous tree species: look for Oregon white oaks on south and southeast facing meadows and big leaf maples, alder, and ash intermixed with the ubiquitous Douglas firs on slopes that receive more shade and rain. If you have a full day to spend and can drive deep into the hills or closer to the coast, the hiking possibilities are nearly endless. A trip up the McKenzie River Corridor is worth a weekend at least. 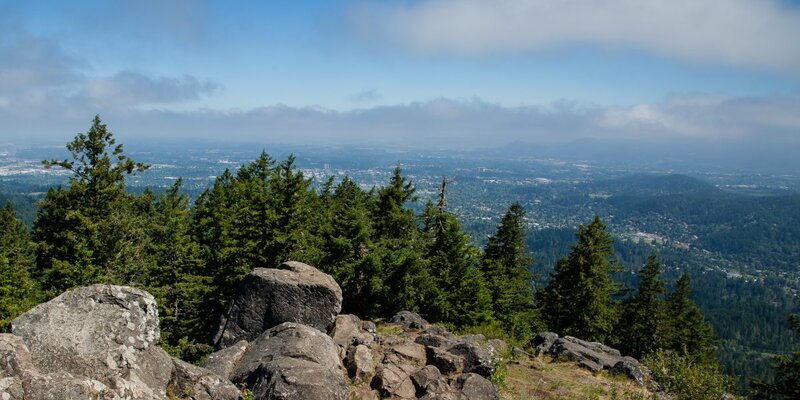 But the great thing about Eugene is how easily you can orchestrate a quick jaunt, be it a trail run or a half-day hike, that will quickly immerse you in a little piece of Oregon’s natural beauty. Here’s a list of 10 classic hiking areas around an hour’s drive from Eugene that are each remarkable little escapes, and many have the potential to become longer excursions if you can afford the time. Some additional ideas can be found in the recommended adventure tiles below. Happy hiking! Eugene from Spencer Butte. Photo by Halvor Tweto. Ruth Bascom Riverbank Trail System: Don’t overlook this incredible trail system just because it is so well developed. Almost 15 miles of accessible trail for runners, walkers, and bikers traces the Willamette, leads through wetlands, and passes Skinner’s Butte. Connecting the University of Oregon, Springfield, 5th Street, and downtown, few cities are lucky enough to have such an important corridor for outdoor recreation and transportation. Spencer Butte: A quick mile gains over 700 feet of elevation for great views of Eugene, Springfield, the Coast Range, and several Cascade peaks. Heavily used, but also heroically maintained by volunteer groups. You'll find route options and trail network intersections for loops, different workouts, or to find a little peace and quiet. Mount Pisgah: Also a fixture in the area, the 1.5-mile climb to the top is the most popular route and a fantastic workout. There are plenty of additional trails to explore on the mountain, however, and these beautiful areas receive only a fraction of the traffic. In addition, the Mount Pisgah Arboretum is a separate network with easy to moderate trails that lead through wetlands and groves. Brice Creek: A gorgeous trail winds through miraculously preserved old-growth forest and right along the creek. A great hike any time of year, the creek is especially refreshing in summer. Consider extending your hike to see Upper Trestle Creek Falls while you’re there. Fall Creek: Like Brice Creek, this drainage is a beautiful stop in summer, though it does receive plenty of traffic due to the easy road access. The trail goes relatively unused in spite of this, so a short hike can go a long way toward finding some solitude. Also note that the crowds drop off considerably from late fall to mid-summer. Eula Ridge Trail. Photo by Jessica Beauchemin. Eula Ridge: A steep climb through a dense and lush forest, this hike gains 3,300 feet in just over 3 miles to reach the summit. Even if you don’t make the top, however, the forest is worth the walk. And trailhead access doesn’t get any easier. Goodman Creek: Don’t let the mountain biking intimidate you! This is a shared use trail that is fantastic for everyone, and users are almost always courteous and respectful. Fantastic hike through maples, firs, and lush groundcover. Can easily extend to Eagles Rest. Eagles Rest: An extension of the same lush forest present in the Goodman Creek Trail, but this stretch comes with views and a shelter. Another easily accessible trail year round that is a fantastic workout and scenic walk. South Willamette Trail: A great connector between the Eula Ridge Trailhead and the Hardesty Trailhead that is ideal if you have a shuttle option. Presents much less elevation gain than other trails in the area, and for this reason it can be a good choice when winter weather presses in on the higher elevations. Alsea Falls: Plenty of trail options allow for a short hike or a full day of exploration. Several falls to enjoy, and restroom and picnic facilities make this a great option for families.